The NFL traffics in rank hypocrisy often without consequence. Profess concern about head injuries, while demanding an eighteen-game season? Decry racial slurs while profiting off of a team called the Redskins? Say you are role models while ignoring domestic violence? Profit from publicly funded stadiums while maintaining nonprofit status? This is Roger Goodell's shield and you can smell the rot from outer space. 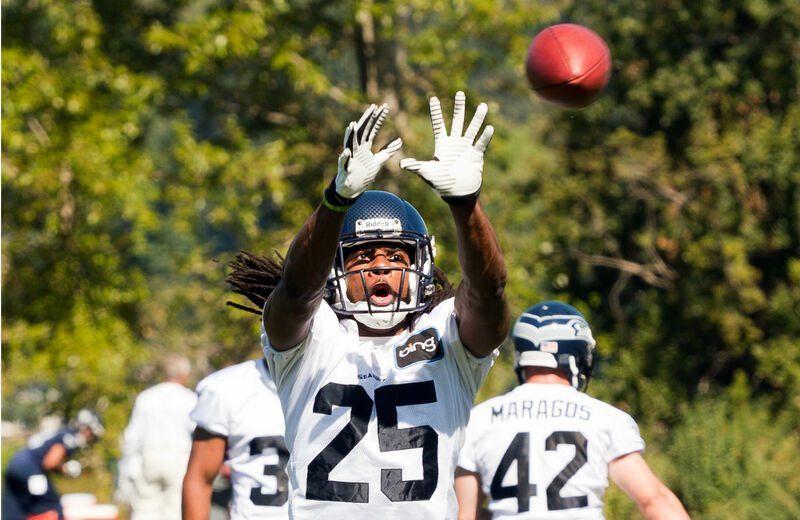 Stepping into this moral vacuum we have Seattle Seahawks cornerback Richard Sherman. Sherman is more than a breath of fresh air. He's oxygen in a moral corpse. After spending Super Bowl week compelling the media to recognize what they are actually saying when they call young black athletes "thugs," Sherman called out a different hypocrisy. Even better, he did it for a friend. The NFL world roiled last week when Philadelphia Eagles star wide receiver DeSean Jackson was abruptly released. News then leaked that a reason was that Jackson had "gang ties." It is unclear whether this was whispered by the Eagles to justify the cost-cutting move, but there was definitely a whiff of something that did not sit right. The cutting of Jackson and subsequent leaking of the "gang ties" accusation also happened after Eagles re-signed their N-bomb dropping wide receiver Riley Cooper. In normal NFL times, acts of hypocrisy such as this go unchecked. But DeSean Jackson grew up in South Central Los Angeles with Richard Sherman. In Sherman's words, "we come from the same dirt" and he felt compelled to write a response to all the rumors. I’m not going to tell you that DeSean Jackson isn’t in a gang, because I can’t say unequivocally that he isn’t…. I can only tell you that I believe him to be a good person, and if you think, say or write otherwise without knowing the man, you’re in the wrong. And if it’s true the Eagles terminated his contract in part because they grew afraid of his alleged 'gang ties,' then they did something worse…. But go ahead and judge DeSean for the company he keeps. While you’re at it, judge me, too, because I still live in Los Angeles, and my family does, too. We didn’t run from where we grew up. "This offseason [the Eagles] re-signed a player who was caught on video screaming, 'I will fight every n— here.' He was representing the Philadelphia Eagles when he said it, because, of course, everything we do is reflective of the organization. But what did they do to Riley Cooper, who, if he’s not a racist, at least has 'ties' to racist activity? They fined him and sent him to counseling. No suspension necessary for Cooper and no punishment from the NFL, despite its new interest in policing our use of the N-word on the field. Riley instead got a few days off from training camp and a nice contract in the offseason, too." Altogether it is a remarkable statement about the double standards of race and class that stain the league. It stands as a rebuke to the relentless, unending stigmas young black men endure based upon not only how they look but where they are from. As for Richard Sherman, he is something we have not seen in a long time: an athlete who is perilous to his own paymasters. What makes him dangerous is that he is both untouchable as an athlete and merciless as a critic. I think I started thinking Richard Sherman was truly special when a reporter compared him to Muhammed Ali and he would not hear it. He said, “It’s very humbling to be compared to Muhammad Ali because…he had to really stand his ground and almost go to jail because he wanted to stand up for what he believed in. So I think his situation was a lot more brave and a lot more serious than my situation is now, obviously, and he had to deal with a lot more scrutiny and just headache and criticism." Richard Sherman is now officially risking more than just "headache and criticism." We have had more than a few athletes over the last thirty years who refused to "know their place." But we've had few who also knew their history. That's what makes Richard Sherman so dangerous to the NFL and that's also what makes him so valuable to the rest of us. By defending his dirt, Sherman shows how much the league acts in a manner that can only be described as dirty.